I have been hesitating to post this because I don’t have much in the way of photo documentation, plus it’s sad. On Monday (June 25th) we had very heavy rain and thunderstorms. 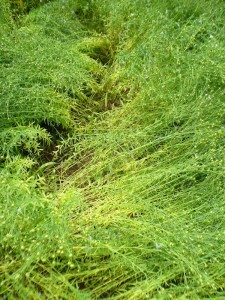 It had been very hot for a few days and I’d been watering the flax and garden each day, so I was glad for the rain. But on Tuesday I arrived at the community garden to a very sad sight. The v.n.s. looked as if someone had parted it with a comb down the middle of the bed, and then combed it flat on either side of the part. Flat. Poor flat flax. I hadn’t brought my camera, so there is no photo of the scene, but maybe you can conjure a mental image. I tried to fluff it up and shake off the excess water and encourage the stalks to stand upright again. They stood up a little, in a wobbly way, but I fear their former graceful and erect stature is gone forever. 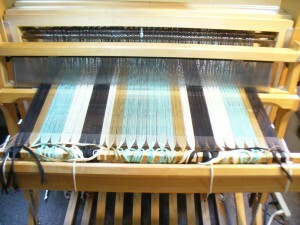 The Marilyn, which has already suffered from lodging, was also hard-hit. In contrast, the Evelin was not affected, happily. Later on Tuesday I checked on the plot at Amethyst Farm, and there was a similar scene there. Last week when I went to check on the flax at Small Ones Farm, their barn cat, Squeak, was lolling about in the flax bed as if it was the perfect place to nap, or perhaps hunt mice. Or just to hang out. 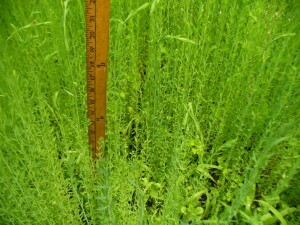 Flax does have a strong smell, even while it’s growing (and stronger still while it’s drying). Maybe it’s appealing in a catnip-like way. Who knows. 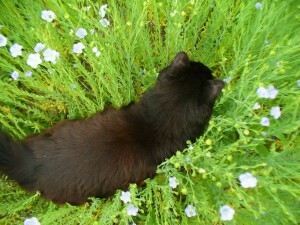 Anyway, here’s Squeak in the flax. Back in May I was visiting family in Maryland, and made some cordage from an unidentified plant growing behind my sister’s apartment. Click here to read the earlier post and Simone’s comment. Now it is in bloom, and she has sent me some photos. At first glance I think it is some kind of milkweed relative, judging by the flowers. I will look into it. Here are the leaves. Happy Solstice to all! Here in Amherst it is a sweltering, bright, gloriously sunny day. 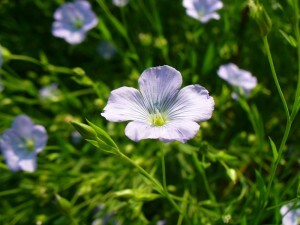 Flax is in full bloom. 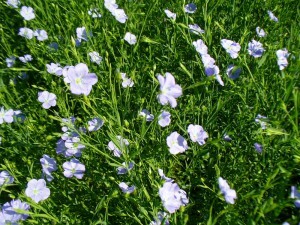 Even though hot weather is not necessarily to flax’s liking, it has been looking stately and graceful over the past several days. I’ve been giving it extra water for encouragement. I have been impressed with how many bees I see at every plot, even though only Amethyst Farm actually has honey bee hives on the property. I enjoy their little buzzing sounds, which are as soothing and blissful as a cat’s purr. I love watching them bumble up and down, and the way a flower head droops down when the bee lands. Happy bees feasting in flowers is quintessential summertime. 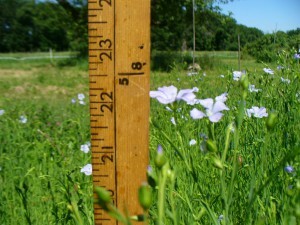 Well, two months after planting, all the flax is blooming. This is exactly as it should be, and is very reassuring in a year when plants are otherwise not synched up with my sense of when they should be blooming (Queen Anne’s Lace already in bloom? What? Chicory??? No!!!). 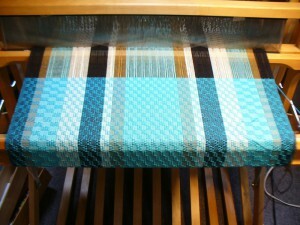 But, more on this later…. 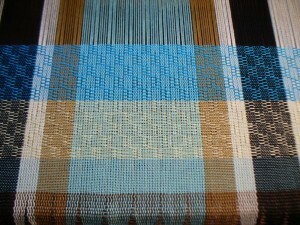 Back to flax news! At Amethyst Brook and Small Ones Farm, the v.n.s. wins the prize for most prolific flowers compared to Evelin and Marylin, at least at this point, at least at the times of day that I’ve observed the plants. At Amethyst Farm, I do not not observe a big difference in the number of flowers blooming between the v.n.s and Evelin, but there is a difference in height, as you will see in a moment. 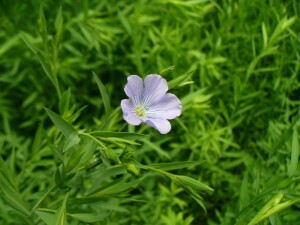 The flax in starting to bloom! 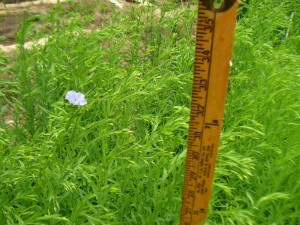 These photos were all taken yesterday, June 12th, at our community garden plot at Amethyst Brook. 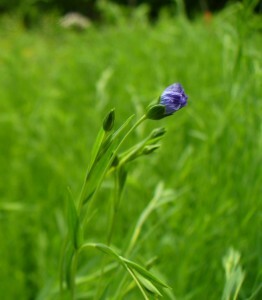 The first variety to flower was the non-specified variety from Richters. 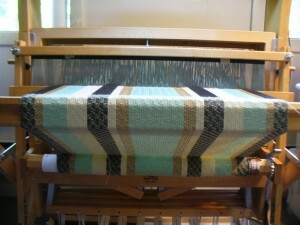 It’s a tad shorter than the other two varieties overall, and as you may recall, it came in a little thin. 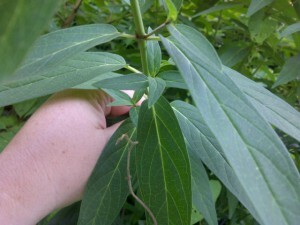 This has meant that the individual stalks have more room to spread out, and the leaves seem larger on the v.n.s. than on the other two varieties. 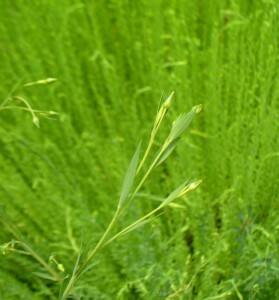 Spreading isn’t considered desirable with fiber flax, because the more branches the plant develops, the shorter the fibers will be. In this photo I happened to catch a little green bee-like pollinator at work. Sorry it’s blurry, but I didn’t even realize it was there until after I took the photo. 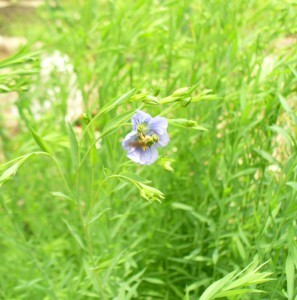 Last year I learned from Cliff Hatch at Upinngil Farm that flax flowers are pollinated by bees and other insects, and will not produce a lot of viable seed without them. I am not trying to save seed this year (hence I am growing more than one variety close together). There aren’t any beehives near the Amethyst Brook gardens, but as you an see, we get a few other pollinators. 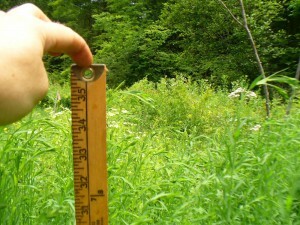 Measuring the heights of the plants proved a bit trickier to do by myself than I thought it would be. 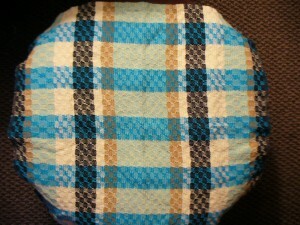 Again, apologies for the quality of the photos. Next time I will bring along an assistant. 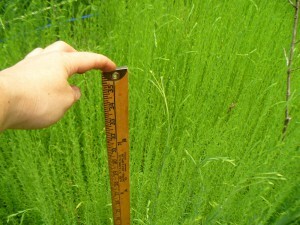 The Marylin is a full 36 inches and some plants are taller. 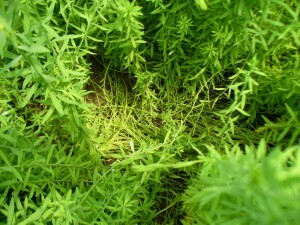 However, it has suffered from lodging, which is when the plants fall over and don’t straighten up again. I noticed the lodging at the end of May. Here’s how it looked on May 28th. I decided not to do anything to correct the problem (for example, staking). The point of the whole exercise this year is to see how different varieties compare under similar conditions. The Marylin came in very thickly compared to the other two varieties, and grew much faster initially. I think this may be have due, in part, to the competition between the plants. In theory, you want to sow thickly so the plants will grow as tall as possible and as straight as possible, without branching. However, perhaps they outpaced themselves, and got too tall for their own stalks to support. Maybe Marylin needs to be planted less densely. 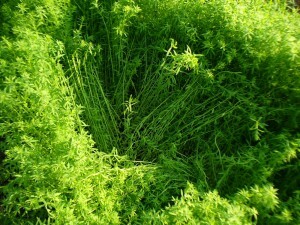 Anyway, that’s the news from flax land.